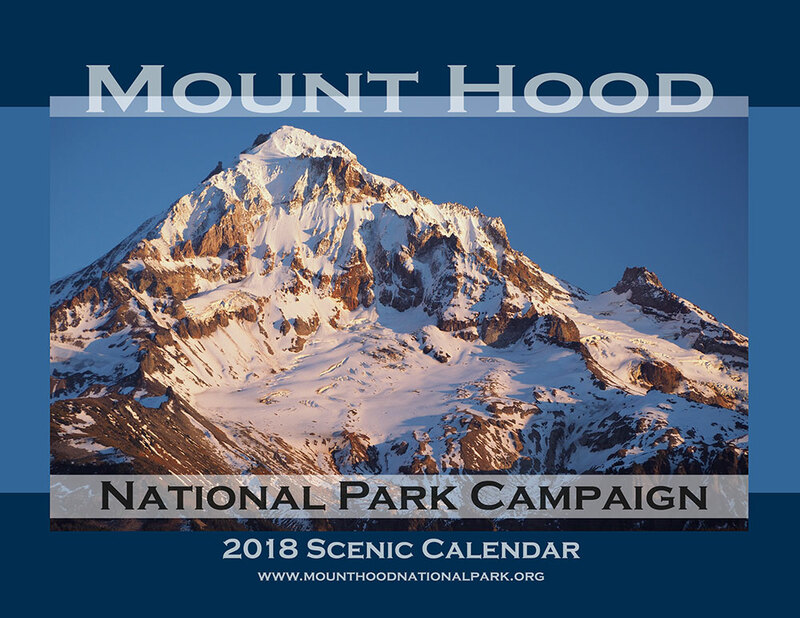 2018 Mount Hood National Park Calendar! The monthly layout remains the same as last year, with a classic “grid” design that serves nicely as a working calendar for kitchens or offices. The finished calendar hangs 14 inches wide by 22 inches tall, with a white wire binding, and the print quality of the photos is excellent! 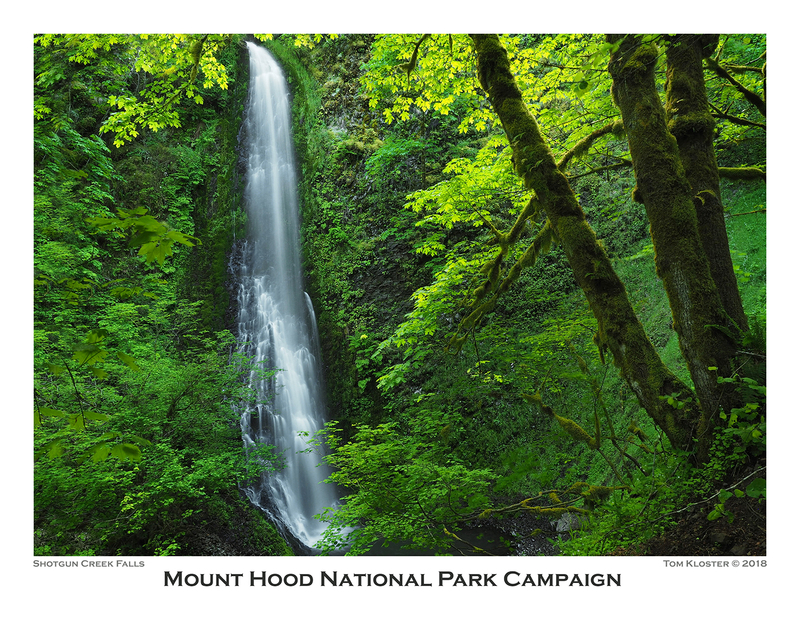 In the past I’ve used calendar sales help cover some of the modest costs of keeping the campaign website and WyEast blog up and running, but beginning this year I will shift to sending all proceeds to Trailkeepers of Oregon, and in turn, TKO’s coming efforts to help recover our Columbia River Gorge trails from the impacts of the 2017 Eagle Creek Fire. 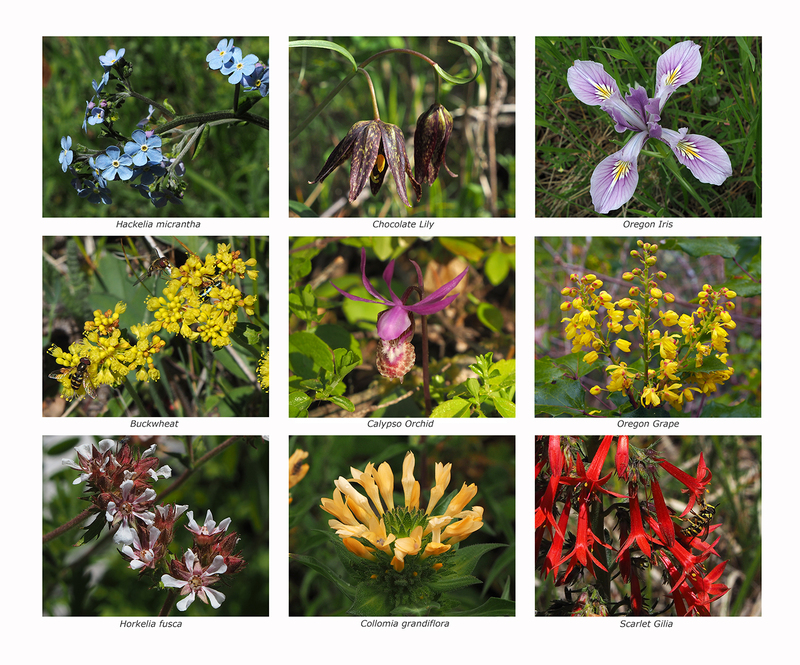 The great thing about putting these calendars together is that it ensures I continue exploring new places in the gorge and on the mountain, as each calendar consists exclusively of photos I’ve taken over the previous year. 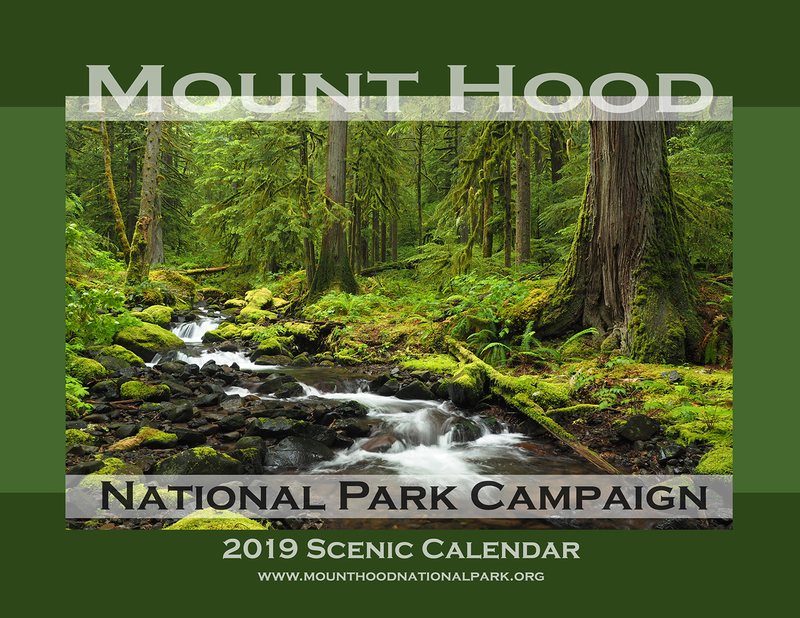 In this year’s calendar article, I’ll provide some of the stories behind the photos in the new Mount Hood National Park Campaign Calendar — sort of a visual year-in-review! The following is a rundown of the 12 images inside the calendar by month, with a link to a large version of each image, too (you can see them by clicking the link beneath each preview image). 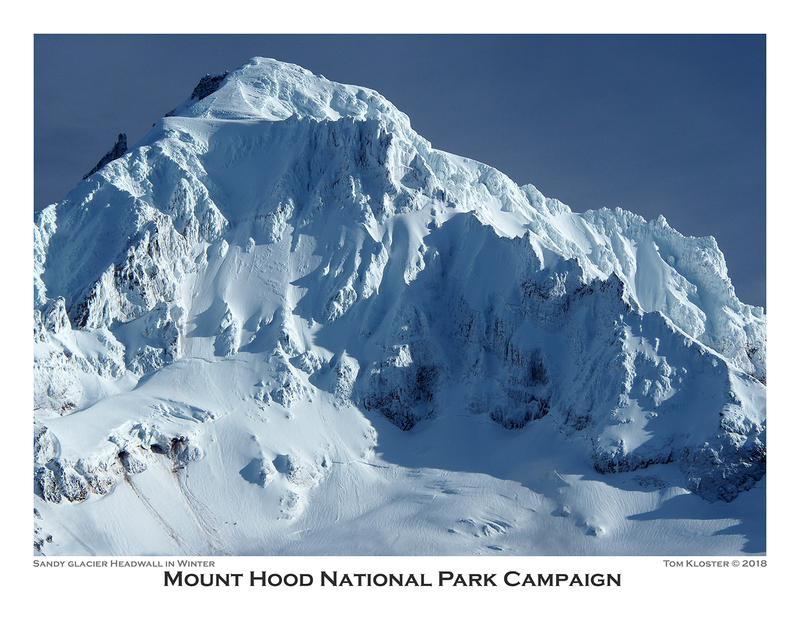 The 2018 calendar begins with the cover image (at the top of the article), featuring the steep Sandy Headwall on Mount Hood’s imposing west face. 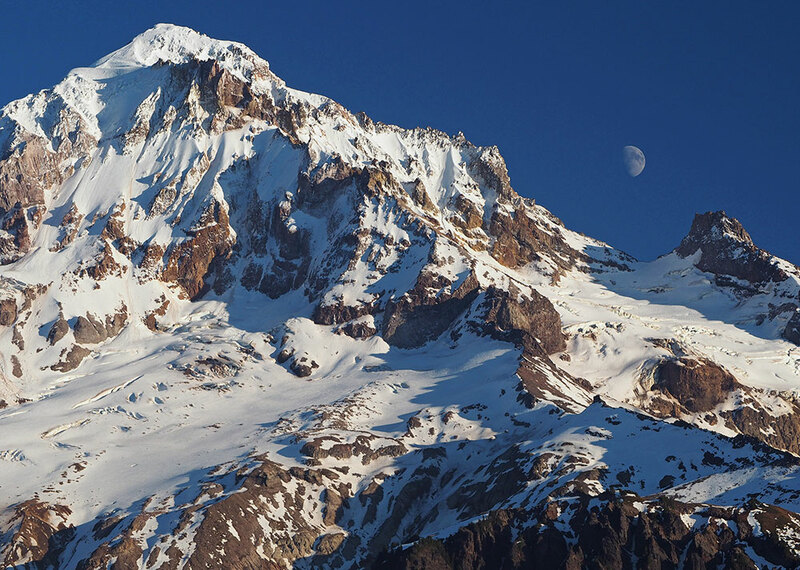 This is the view Portlanders have of their mountain from afar, but a close-up look from along the Timberline Trail reveals the crevassed Sandy and Reid glaciers tumbling down the slopes and the deep Muddy Fork canyon, almost directly below. 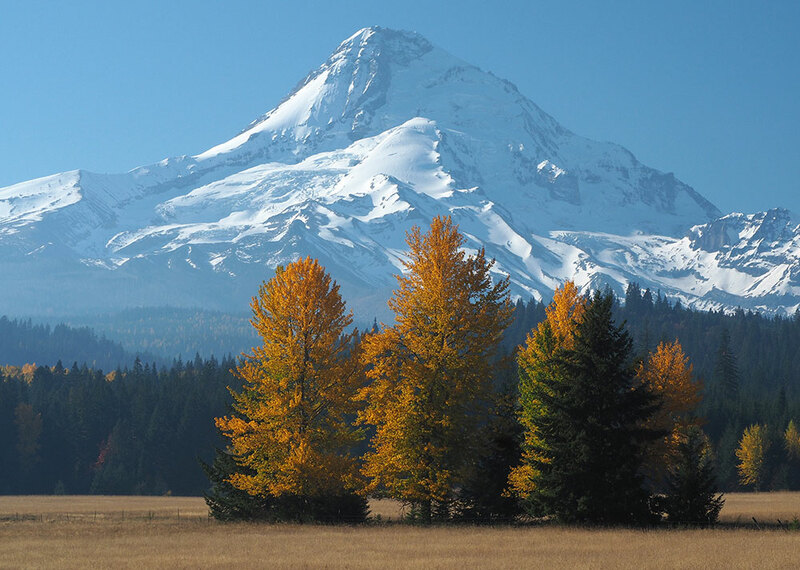 This is Mount Hood’s “tallest” side, with a vertical rise of more than 7,000 feet from the Muddy Fork valley floor to the 11,250-foot summit. 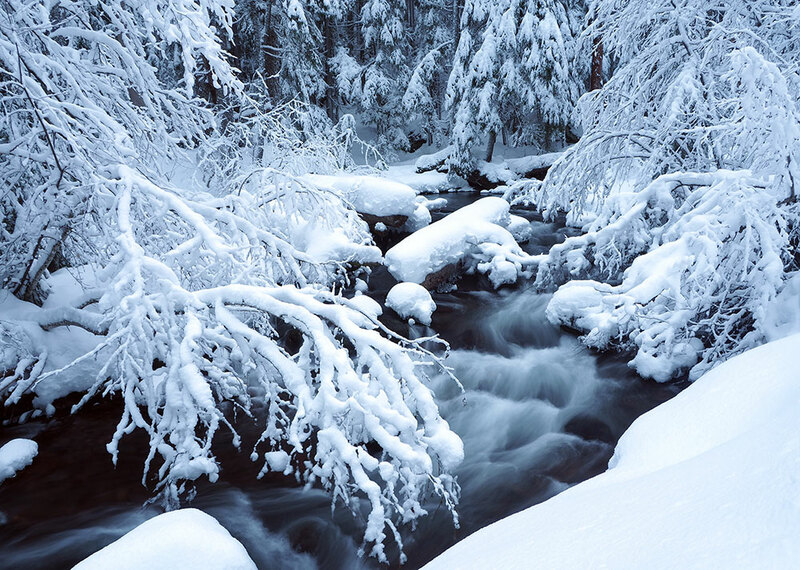 Only a few years ago, the snowshoe hike along Cold Spring Creek to Tamanawas Falls was completely off the radar for most, but in recent years its popularity has soared, and the trailhead is now packed on winter weekends. As it turned out, what apparently was a difficult rock fall to negotiate over the summer was much easier to travel with a couple feet of snow covering the debris. The rocks fell in a section of canyon just below the falls that experienced an enormous cliff collapse in the early 2000s, and continues to be active. The day began with clear blue skies, which is glorious, of course, but not so great for photography. After reaching a favorite viewpoint in the upper canyon, though, bands of clouds began floating in, making for some memorable scenes of a cloud-framed mountain. The photo below was taken on the way out that day, as evening shadows began to stretch across the lower canyon. As covered in previous articles, fire in the Columbia River Gorge is as much a part of the ecology as the trees, themselves. But if you had told me the extent of the Eagle Creek Fire last spring, I wouldn’t have believed you. 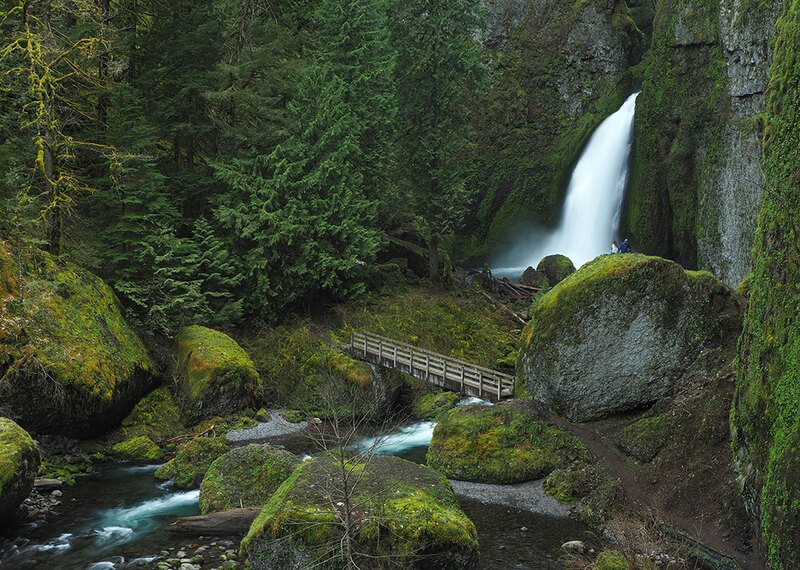 For hikers, it’s almost like the Eagle Creek Fire was connecting dots among favorite Columbia River Gorge beauty spots, with only a few of the iconic waterfalls that make the Oregon side of the Gorge famous escaping the flames. So, even knowing and accepting that fire is a necessary and beneficial part of the ecosystem still doesn’t blunt the harsh reality that this fire felt personal. And it’s going to take awhile to heal. As the fire raged west toward Portland last September, my immediate thought was Tanner Creek, the next drainage to the west of Eagle Creek and directly in the path of the inferno. 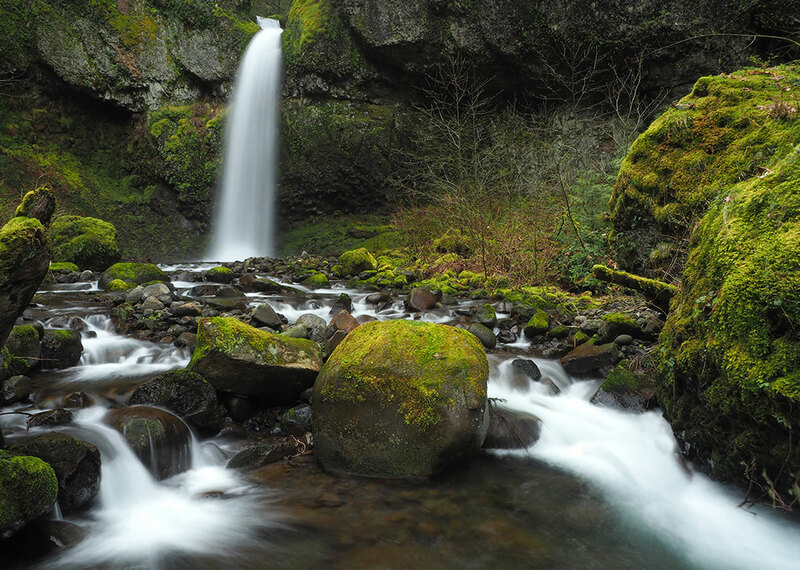 If I had to pick a spot that embodies almost everything that defines the Columbia River Gorge, Tanner Creek’s lower canyon is it, culminating with spectacular Wahclella Falls. I didn’t know the answer to that question until a week or two ago, when I came upon some aerial photos of the Gorge taken sometime this fall. My scientific acceptance — embrace, in fact — of fire in our forests aside, I was selfishly relieved to see that the deep gorge surrounding Wahclella Falls had somehow been missed by the fire. Or had simply resisted it. Wahclella Falls is at the bottom of the photo, and Tanner Creek’s lesser-known upper gorge and the string of waterfalls that continue above Wahclella Falls can also be seen in this view. This is a place where I hope to see a trail, someday. Maybe in the destruction of the forest we’ll see new trails to places like this, where we take in new sights while also watching our Gorge recover? This waterfall is off-trail, and requires walking a mile or so up the streambed of Moffett Creek to reach it. I first visited this falls in the early 1980s, and have returned several times over the years. 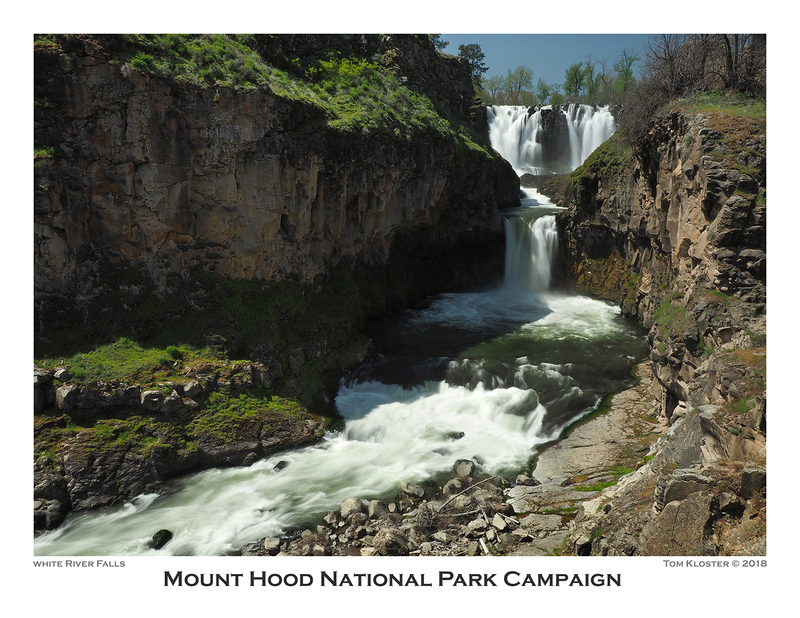 Sometime in the late 1980s or early 1990s, a massive rock fall occurred here, and completely changed the landscape below the falls and the canyon slopes to the west. 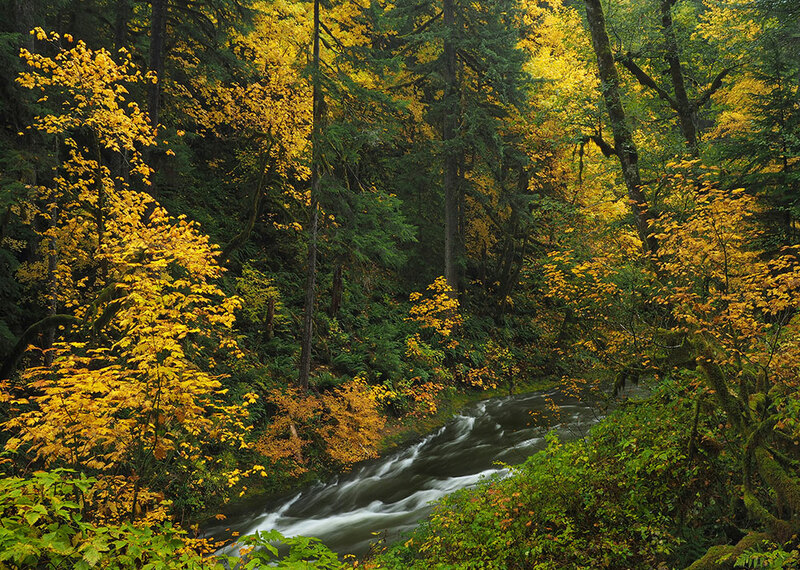 Before the fire, the scene was already one of recovering forests, with young groves of Red Alder flanking the falls and lining the rearranged creek for 100 yards downstream. The Eagle Creek fire was just the most recent calamity to sweep through this spot, and such is the dynamic, often cataclysmic nature of the Columbia River Gorge. 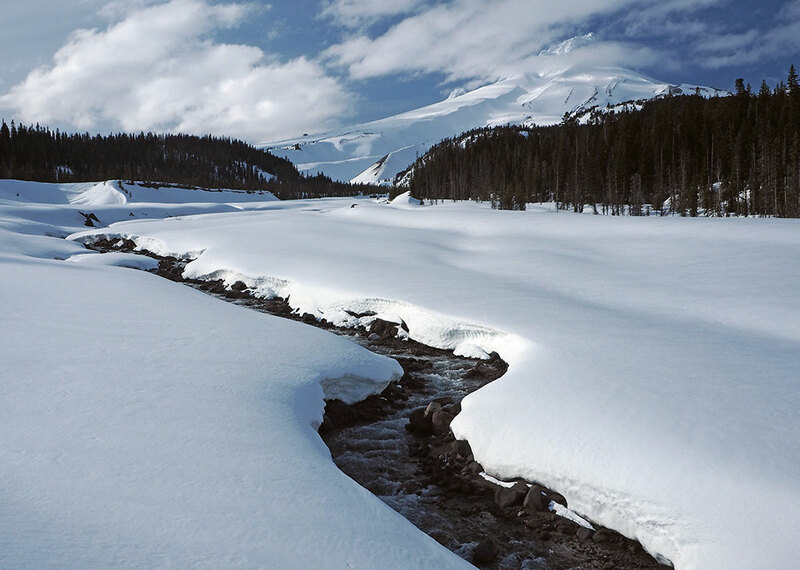 Snowdrifts on Moffett Creek in mid-April! 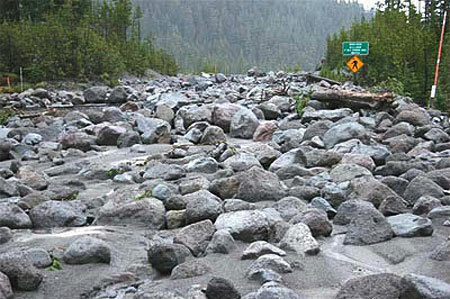 Our trip last April was complicated by an extremely late snowpack, following a very wet and snowy winter in the Gorge. The canyon, itself, was a tangle of downfall from the harsh winter, making it a rough trip compared to previous years. More about that trail concept, and the need for a long-term trail plan for the Gorge in a future article…! Did you know that today’s Silver Creek State Park has been proposed to become a national monument or park at least a couple of times in the past? It makes sense, given the spectacular concentration of waterfalls within this beautiful preserve, and especially with the legacy of trails and lodges left by the Civilian Conservation Corps (CCC) during their 1930s heyday. 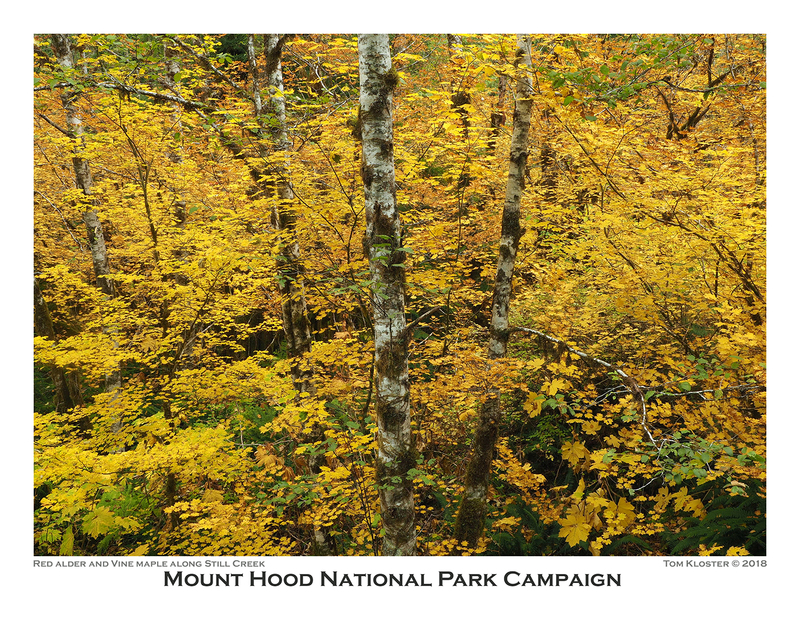 Many believe it to be a national park or monument today! While our current regime in Washington D.C. is more focused on tearing away protections from our public in order to sell our resources off to corporate interests at bargain prices, it’s also true that the exploitation/conservation pendulum in our country swings both ways. In some ways, the outrageous anti-environment, anti-science and anti-public lands extremism we’re seeing with the Trump administration has already kicked off a counter-movement. It can’t come soon enough, and hopefully you’ve joined in the opposition, too. 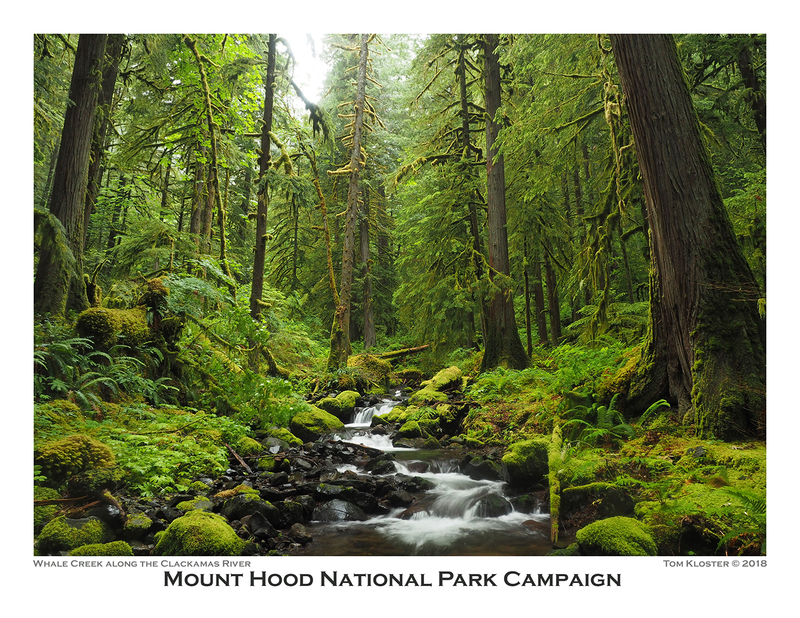 Someday, when the pendulum does swing, Silver Creek would make an excellent unit of a future Mount Hood National Park. Why? 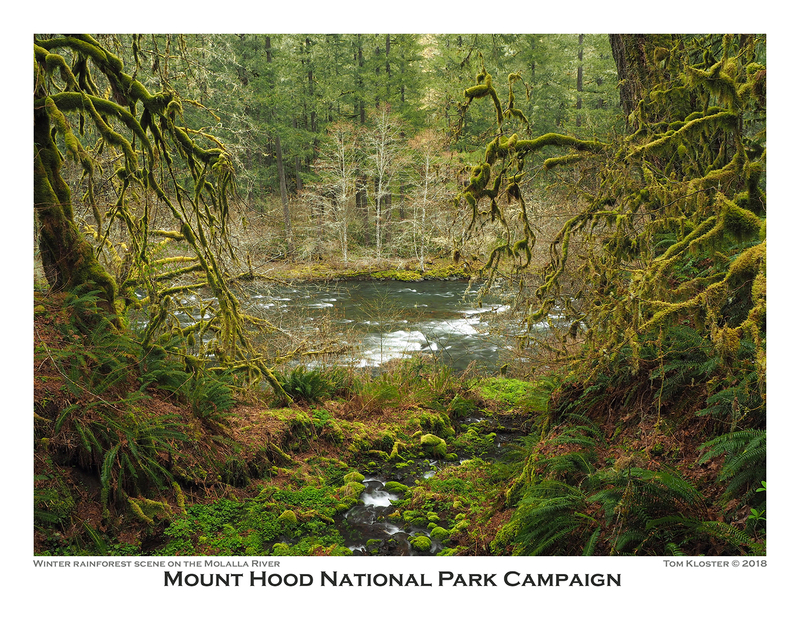 Because the current park contains just a small slice of Silver Creek’s larger ecosystem, and today’s beautiful scenes of waterfalls and mossy glades are increasingly threatened by upstream development and industrial-scale logging. Watch for a future article on this topic, too! 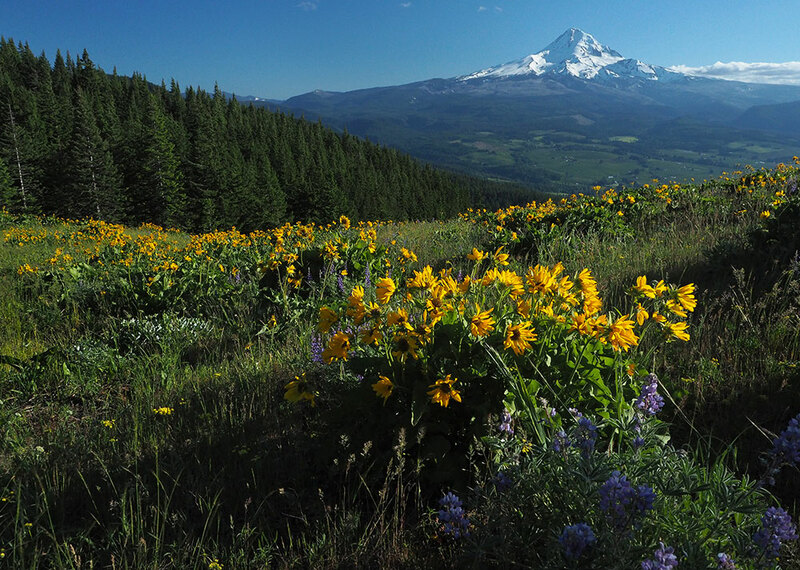 This lovely butte rises directly above the Hood River Ranger Station, so close that Forest Service workers can enjoy the expansive wildflower spectacle from their offices, about a mile-and-a-half away as the crow flies, and some 2,200 vertical feet below. You’d think being at the Forest Service’s front door would give pause to those who view our public lands as their personal playground to destroy. But Hood River County has a lot of off-highway vehicle (OHV) enthusiasts, and some in that community make a point of illegally driving their jeeps, quads and dirt bikes up the fragile slopes of Bald Butte — despite prominent signage prohibiting their use and periodic efforts to block them. This is an ongoing battle with rogues that will someday be won, but it will take the OHV community policing itself to make the change happen. There will never be enough Forest Service crews to fill that void. How bad it is? Well, the old lookout track that serves as the hikers trail to the summit has become deeply rutted by illegal jeep and motorcycle users, which in turn, has inspired them to form parallel tracks on the open wildflower slopes (above). It will take decades for the damage to recover, even if the law breakers were stopped today. Meanwhile, dirt bikers have hauled in chainsaws in order to carve new trails through the forests on the east slopes of Bald Butte. It’s not a pretty picture, and so far, nobody in the OHV community seems to be stepping up to confront the lawlessness. The Forest Service has indicated an interest to work with trail organizations (like TKO) to step up the efforts to keep OHV vandals out of Bald Butte, but in the meantime, they’re doing a lot of damage — which, in turn, is a black eye for anyone who enjoys using OHVs responsibly. Let’s hope they will join in the effort to protect Bald Butte, too. 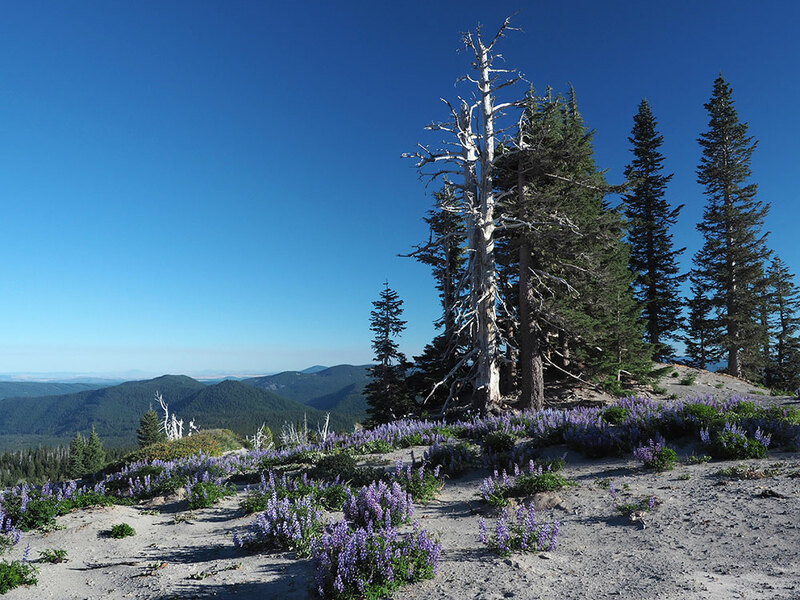 For more about Bald Butte, and comparison photos that show the rapid progression of the OHV damage there, please see this earlier article on the blog – you can read it here. 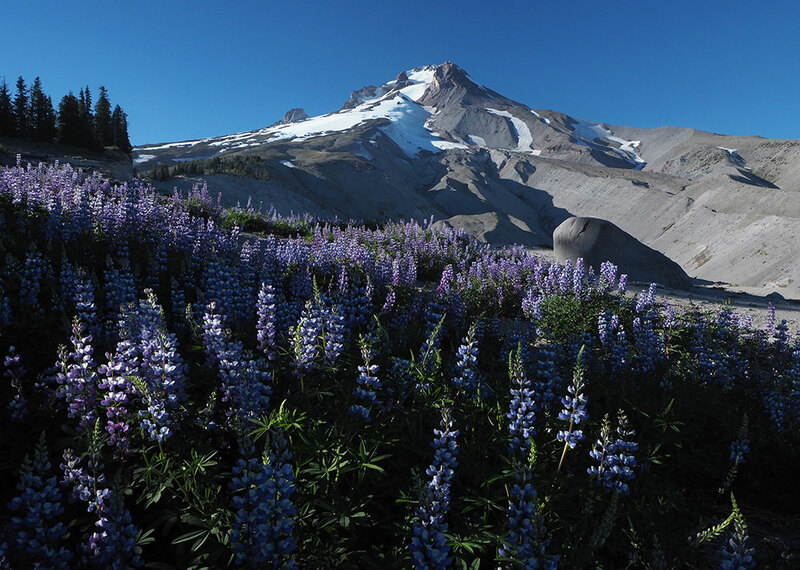 Though we had a decent snowpack in the Cascades in 2017, it melted fast when summer arrived, and many trails on Mount Hood’s west slopes were opening by late June. So, when college friends David and Robin, from Colorado, called to say they would be in Portland and wanted to spend a day on the mountain, the hike to the Muddy Fork Crossing was the perfect choice! It turned out to be a bluebird day, but what I found most interesting as we caught up on our parallel lives was their reaction to being in Pacific Northwest alpine country, again. Though David grew up here, he still marveled at the magnificence of our forests, especially the huge Noble fir groves we passed through, and Robin was especially taken with the amount of water, everywhere! It was a timely reminder for me to never take our unique ecosystems for granted. Colorado has more big peaks than most any state of the country, but we are unique in our abundance or water and the verdant landscape it brings, from our rainforests, streams and lakes to the glaciers that hang from our peaks. As we head into the uncertainty of climate change in coming decades, we’ll need to learn to view these seemingly abundant resources as precious and threatened, and no longer something to take for granted. Another surprise along the hike was a new sign — finally! — marking the well-trod “cut off” that shortcuts the Timberline Trail where Bald Mountain (not to be confused with Bald Butte) meets McGee Ridge. I’m sure there was some official slight-of-hand required for the Forest Service to post this junction, as it is simply a user trail, and thus unsanctioned. But it’s a good call that will help hikers better negotiate the maze of trails in this area. 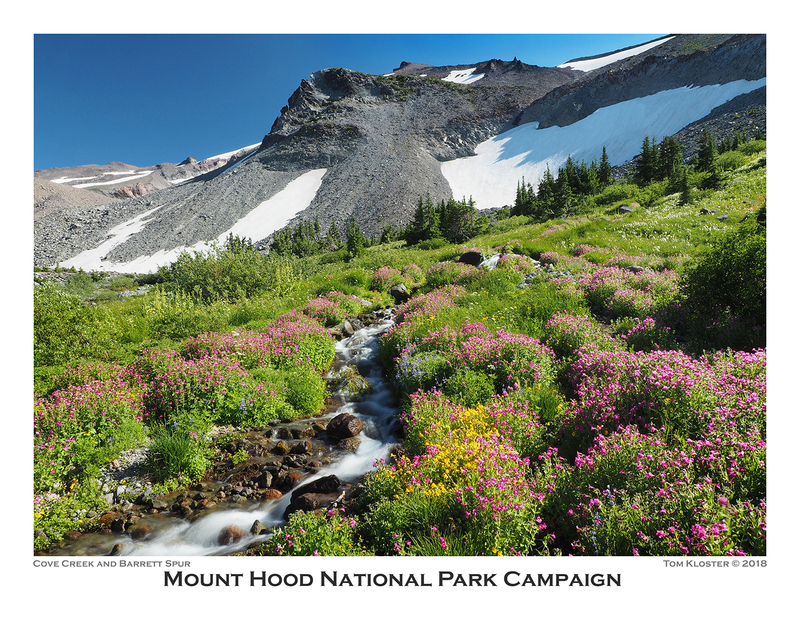 For August, I selected a photo from a favorite meadow perched along a ridge I call the White River Rim. A fragile island of Whitebark Pine, Mountain Hemlock and Subalpine Fir groves grow here, hemmed in on both sides by deep, perpetually eroding canyons of loose sand and boulder. To the east of the rim is a maze of deep ravines that make up the White River Canyon. As the White River continues to cut into the loose volcanic slopes, here, whole sections of the ridge-top forests and wildflower meadows perched on the rim slide into the canyon. 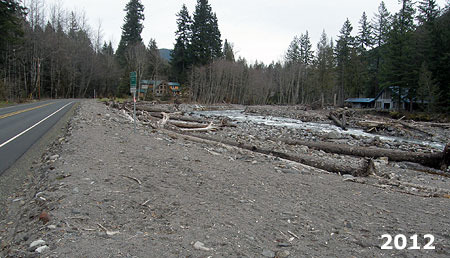 The Salmon River is gradually eroding the rim from the west, as well, though less voraciously than the White River. In some spots, the flat ridge top is just a few feet wide, and losing ground fast. This is one of the most dynamic areas on the mountain. “I wondered, could Douglas fir recognize its own kin, like mama grizzly and her cub? So we set about an experiment, and we grew mother trees with kin and stranger’s seedlings. And it turns out they do recognize their kin. “Mother trees colonize their kin with bigger mycorrhizal networks. They send them more carbon below ground. They even reduce their own root competition to make elbow room for their kids. When mother trees are injured or dying, they also send messages of wisdom on to the next generation of seedlings. 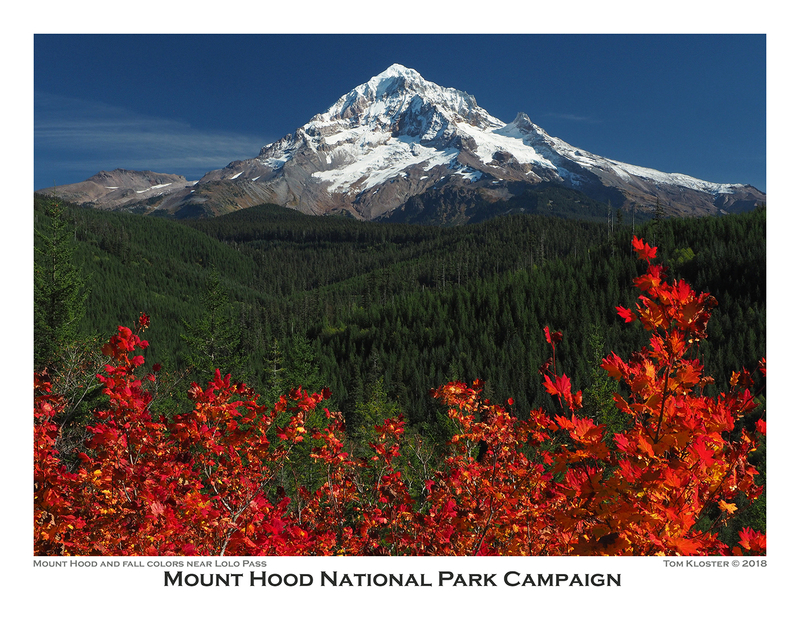 The September image in the new calendar captures an intersection of three threads of good fortune: an afternoon away form work to visit the mountain, clear weather after an early autumn snowstorm and moonrise over Illumination Saddle, the narrow ridge that connect Illumination Rock to the main summit ridges of Mount Hood. Time off from work on a clear autumn day was by design, but the moonrise was pure luck. While there are web tools for figuring out celestial paths from any point on the ground, I do confess that I’m not likely to use them. I simply sat at a favorite spot on the summit of Bald Mountain (not Bald Butte!) for an hour or so, waiting for the sunset, and was suddenly treated to the moon emerging over the saddle as an unexpected surprise! So, why not use the modern tools? Partly, it just seems like a chore in what should be an enjoyable hobby. But I’d also be turning what was a wonderful surprise into one more thing to worry about — and that’s not why I head into the woods, after all. There’s something to be said for turning over the keys to Mother Nature, right? And on that point, perhaps the best memory from that cold evening on Bald Mountain last fall was watching the sun set through the trees on the hike back down through the ancient Noble Fir forest. This grove of 300-year old giants somehow escaped the chainsaws when the Clear Fork valley, below, was logged in the 1960s, 70s and 80s. It remains as a rare reminder of what used to be — and what will be again, if we allow it. 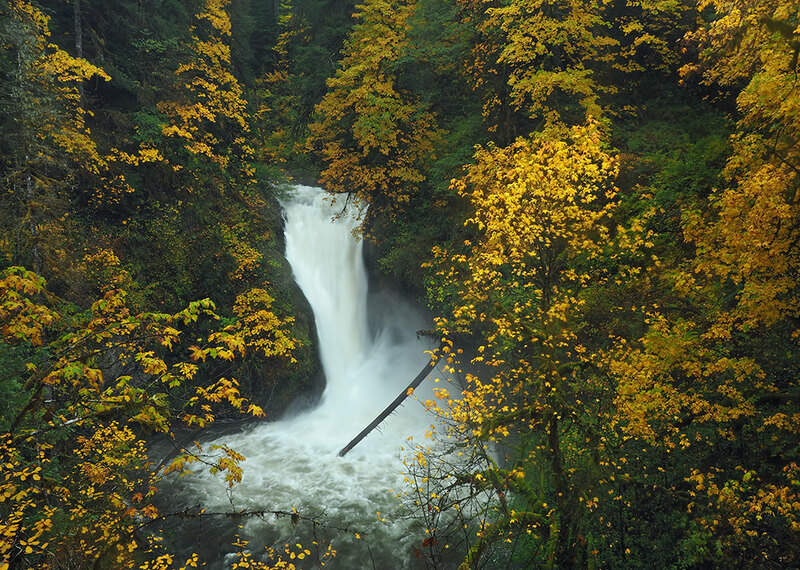 …though this peaceful spot is just 100 yards or so above Butte Creek Falls, which was raging that day, after a series of Pacific fronts had rolled through. 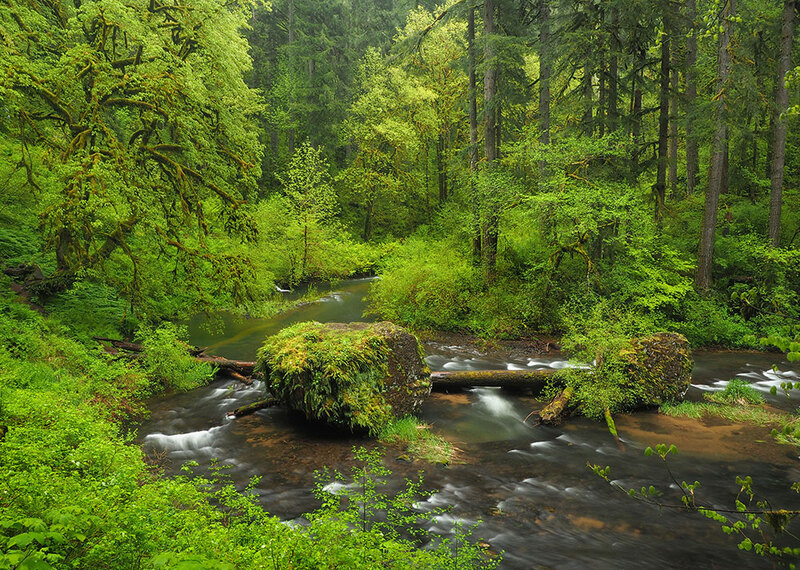 Even more than nearby Silver Falls State Park, the Butte Creek canyon (and its twin, Abiqua Creek, just over the ridge) is in desperate need of a better management vision, and would make for an excellent extension of a future Mount Hood National Park. More about that in a future article, as well..! Though I’ve hiked the short loop trail at Butte Creek many times, the fire in the Gorge had forest ecology and the role of fire in my mind on this visit, and noticed a small army of “legacy trees” throughout the rainforest here. These ancient stumps and snags are from the last big fire to come through the area are called “legacy trees” for the benefits they bring from the old forest to the new. This area likely burned more than a century ago, yet the skeletons of the old forest still serve a crucial role in the health of the new forest. As they slowly decay, old snags and stumps provide habitat for birds and other wildlife, and once fallen, they become “nurse logs”, upon which new trees grow. They also provide nutrients to the precious mountain soil as they decay — something a log hauled off to become lumber or cardboard can never do. 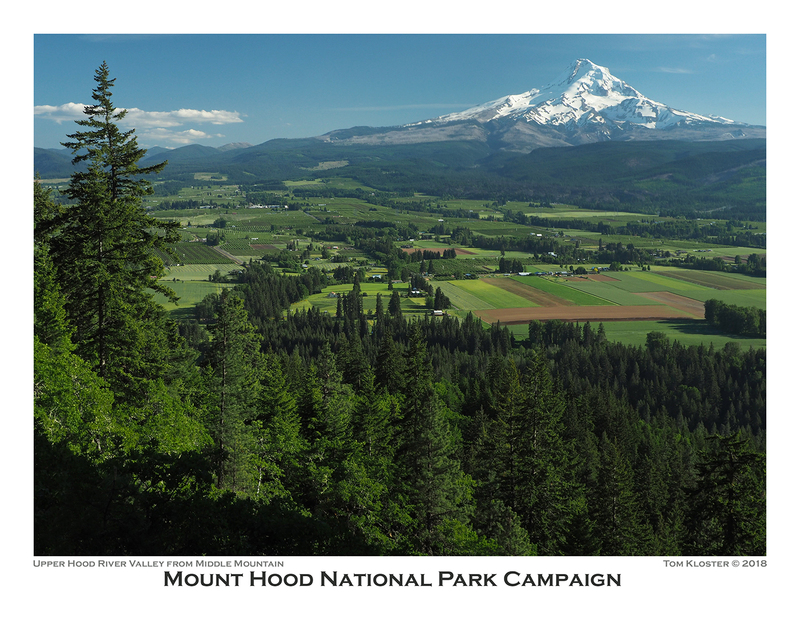 For November in the new calendar, I selected an image from the upper Hood River Valley, with Mount Hood rising above fields owned by a family that has continuously farmed the valley since the 1800s. On this day in late October, the Cottonwood grove at the center of the photo was in peak form, and the fresh coat of snow on the mountain was softened by a light haze in the air from farmers burning orchard trimmings. Notice how much sharper the mountain was on the earlier visit? It could have been wind conditions sweeping away smoke from orchard fires that day, or perhaps the burning season hadn’t begun, yet? Nonetheless, I liked the depth created by the haze in the second view, too. 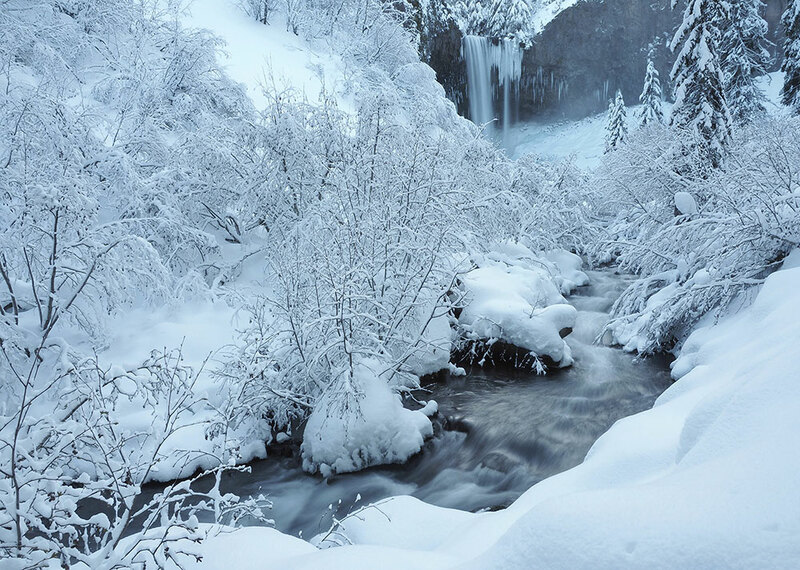 For the December image, I picked this view of Tamanawas Falls on Cold Spring Creek, captured the same day as the opening photo of the creek in the January image. This is always a magical spot, but I’ll share a couple of details about the trip that made the day memorable. First, it’s always an icebox in Cold Spring Canyon in winter. Why? Because the low sun angle in winter months can’t reach the canyon floor due to the steep terrain in all directions. So, while the above image looks like it was taken on an overcast day, the view straight up was of a bright blue sky. The image below shows the cliff section where the recent rock fall occurred, and you can see that the trees on the canyon rim are basking in sun and have shed much of their snow. Patience pays if you want to catch the winter sunburst at Tamanawas Falls! The other story behind this photo is found in the following image. The black metal wand is actually part of a tripod leg (and possibly a piece of my pride, too) that snapped off when I took a fairly long, unscheduled slide down the ice-covered slopes near the falls that day. My mistake was trying to get a little too close for a different angle on the falls, and my humility was only magnified by the fact that a young snowshoeing family watched the whole thing unfold in front of them. As I pretended to calmly fold up my mangled tripod as if it were all a planned event, I overheard their young son say to his parents “Woah! Did you see that man crash and burn? ?” Yes, I’m afraid everyone did..! 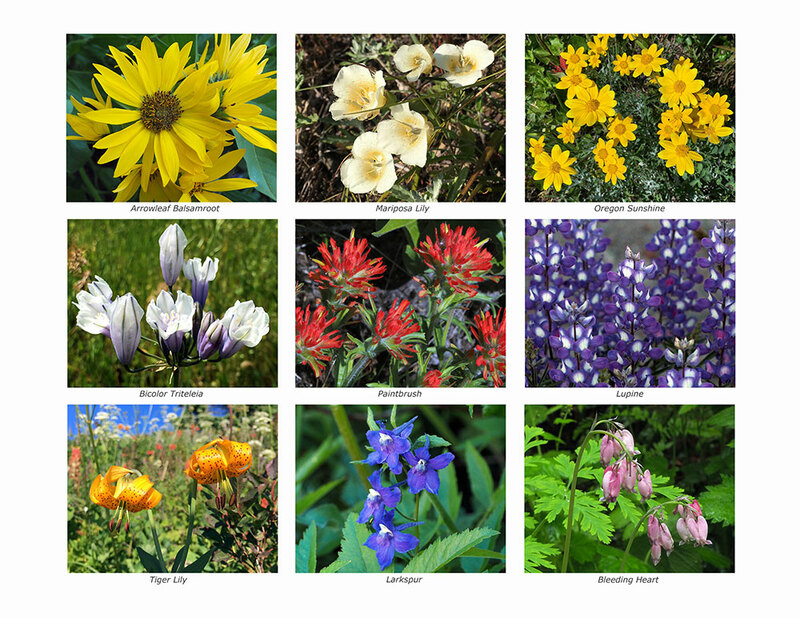 The Zazzle calendar format I’ve been using for the past couple of years also offer a back page, so I’ve continued to use that for wildflower photos that otherwise wouldn’t make it into the calendar. That’s it for the 2018 calendar, but what about the photos I couldn’t fit in..? I’ve made at least one trip to Elk Cove every summer for as long as I can remember, and have a particular spot that I always shoot from (though I also try new spots each year, too!). It’s a favorite scene, but has also been in many calendars in past years, so Elk Cove is taking the year off from the 2018 calendar. But worse, it seemed like bad luck to use this photo, given the somewhat scary tumble I took on the way back to the trailhead later that day. It began with staying too late on the mountain for that gorgeous early evening light, then getting waylaid on the way down the Vista Ridge Trail trail by (more!) plump huckleberries. I filled another water bottle, then hoofed it at high speed in the growing darkness, hoping to avoid digging that annoying headlamp out of my pack. That was my final error. Just 3/4 mile from the trailhead, where the Vista Ridge Trail crosses a rocky, dusty section in the Dollar Lake Burn, I tripped on a particularly sneaky rock and went airborne, crashing into the base of a bleached snag. Fortunately for my head, I had put my arm out ahead of me in the fall. Unfortunately for my arm, it took the brunt of the blow. It hurt a LOT, and I just laid there for a moment, trying to figure out if I was seriously hurt. Nope, all parts seemed to be functioning… except better my better judgment, of course! What followed was a frantic search, first for my tripod (which I had hurled into the ravine below the trail during the fall), then in my pack for my headlamp (where WAS it?) as my right forearm ballooned up to alarming dimensions. Then came a very long 3/4 mile down the trail to the car. Meanwhile, my bloated arm was now turning purple, so I turned an extra boot sock into a makeshift wrap and packed a couple of ice bricks from the cooler. I feared a broken arm — after all, I’d broken this arm twice as a kid (don’t ask). The long drive down the mountain was “interesting” without the benefit of an opposing thumb on my sore arm, and I let out a big sigh of relief when I finally arrived at home later that night. The radiologist remarked on my unusually curvy bones, courtesy a pair of childhood breaks… but no break this time! X-rays a few days later confirmed that I just had a very deep bruise (to both forearm AND pride, it turns out), and several weeks of alternating hot and cold packs followed as things gradually got back to normal. But MORE importantly, I was able to return to the scene of the crash a couple weeks after the event and recover my tripod — yes, the tripod I purchased to replace the one I smashed at Tamanawas Falls! Recon data for the eclipse! Instead, I set up at my beloved Owl Point, on the north edge of the Mount Hood wilderness, and just outside the path of totality (as shown in the map, above). I’m not sure what I expected, but I came prepared with two cameras and two tripods (below) to document the scene at five-minute intervals. I left home at 5 AM and was on the trail by 7:30, anticipating great things! It did turn out to be a memorable experience, but certainly not the beautiful spectacle I had imagined. First, the strange light during the eclipse was not really pleasant — more just weird and eerie. It made sense to me later, that simply blocking out the sun mid-day would create a cast more like what we see when there’s heavy forest fire smoke in the atmosphere — harsh reddish-yellow — as opposed to the soft colors we see at sunset, when the sun’s rays are filtered through a lot more atmosphere. I also learned what the scientists had been telling us: that even with near totality, the sun is blindingly powerful, so from this point just outside the path of totality, it was more “dimmed” than “dark” outside. That said, the birds did go quiet, as advertised. That part was surprisingly creepy. Just short of totality… note the blue dots! Close-up of blue dots reveals the to be reflections of the eclipse in the camera lens! The view from Owl Point just before totality… weird! The view from Owl Point at totality… kinda creepy! What I found most interesting (beyond the weird colors) is that I could see the far side of the path of totality over the west shoulder of the mountain during totality. That gave me the best sense of what the event was all about, and I was glad to have experienced it, though it was definitely not what I was expecting. Just a very interesting experience. On the way out that day in August, I took the opportunity to pick a water bottle full of plump huckleberries, and also some time to reflect on my place in the universe. I had lost a close family member in July, and a day alone on the mountain was just what I needed to sort out my feelings and replay some good memories in my mind. The mountains are great for that sort of thing, and we’re so lucky to live in a place where we have that luxury right in our backyard. And the huckleberries? They were converted into tasty muffins the next day! I’m looking forward to posting a few more articles in the coming year than has been my recent pace. There’s a lot to cover on the WyEast beat, and I’ll be refocusing my volunteer efforts a bit more on advocacy this year, including this blog. 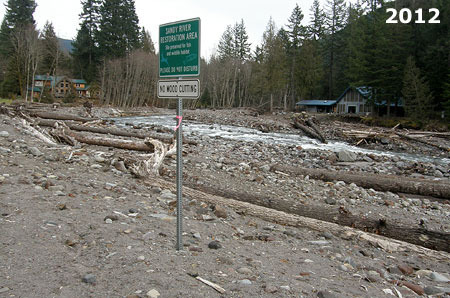 The Eagle Creek recovery effort will be a recurring theme, of course. There is so much to learn from the fire, and there are many crucial choices ahead for land management, too. In particular, I’ll be weighing in on a few topics that I think our non-profit advocates have a blind spot for, or perhaps are shying away from. Most importantly, I’ll spend as much time as I can out in WyEast Country, exploring, documenting and celebrating our precious public lands. As always, thanks for reading the blog, and I hope to see you out there, too! Oregon Public Broadcasting’s venerable Oregon Field Guide series kicks off it’s 25th season in October with a remarkable story on the hidden network of glacier caves that have formed under the Sandy Glacier, high on Mount Hood’s west flank. In the video preview (below), Oregon Field Guide executive producer Steve Amen says that “in the 25 years we’ve been doing Oregon Field Guide, this is the biggest geologic story that we have ever done”. This is bold statement from a program that has confronted all manner of danger in documenting Oregon’s secret places! Glacier caves are formed by melt water seeping through glaciers and flowing along the bedrock beneath glaciers. Over time, intricate networks of braided tunnels can form. Because a glacier is, by definition, a river of moving ice, exploring a glacier cave is inherently dangerous — and this is what makes the upcoming Oregon Field Guide special so ambitious. Cave explorers have been actively exploring and mapping the extent of the Sandy Glacier caves for the past three years. This previously unknown network of caves has been dubbed the Snow Dragon Glacier Cave System by cavers Eduardo Cartaya, Scott Linn and Brent McGregor in July 2011. Cavers have since surveyed (to date) well over a mile of caves in the network, with parts of the cave system nearly 1,000 feet deep. Ice Cave or Glacier Cave? Here in volcano country, it’s worth noting that a glacier cave is different than an ice cave. Where a glacier cave has roof of glacial ice, an ice cave occurs where persistent ice forms inside an underground, rock cave. 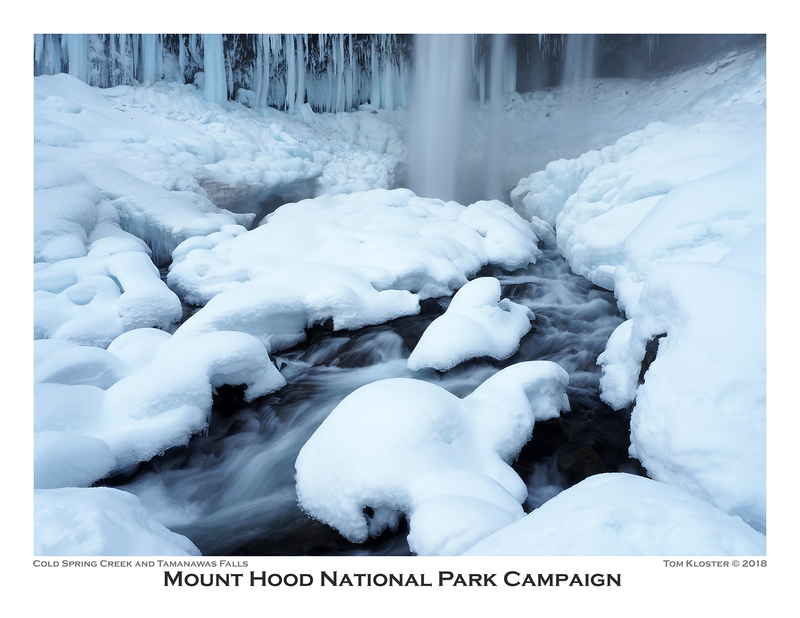 In the Pacific Northwest, we have several examples where ice has accumulated inside lava tubes to form true ice caves, such as the Guler Ice Cave near Mount Adams and Sawyer’s Ice Cave in Central Oregon. To date, the Snow Dragon cave network consists of three caves that intersect, dubbed the Snow Dragon, Frozen Minotaur, and Pure Imagination caves. Within these caves explorers have discovered a fantastic landscape of streams and waterfalls flowing under a massive, sculpted ceiling of ice. The caves are punctuated by moulins (pronounced “MOO-lawn”), or vertical shafts in the ice formed by meltwater. Some of these moulins are dry, some are still flowing, and a few have have grown to become skylights large enough serve as entry points into the cave system for daring explorers. 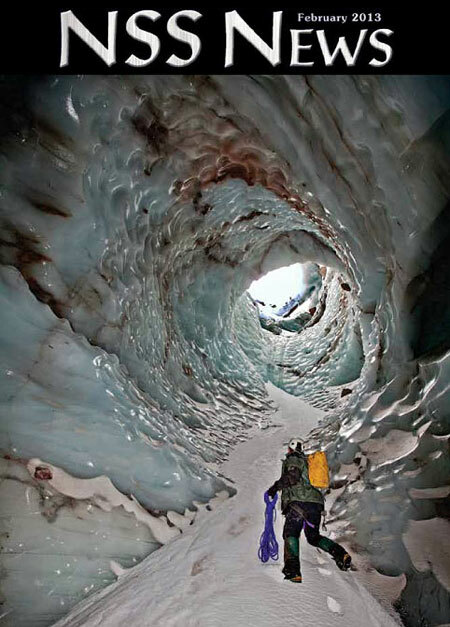 Caving expeditions to the Sandy Glacier caves by the National Speleological Society (NSS) in 2011 and 2012 were featured in the February 2013 NSS News, with a dramatic photo of colossal moulin on its cover. These volunteer expeditions included NSS geologists, glaciologists, spelunkers, scuba divers and mountain climbers who spent eight days documenting the cave system from a base camp high atop the Sandy Glacier. According to the NSS explorers, the Snow Dragon cave complex is the largest ice cave complex in the lower forty-eight states, and one of the largest in the world. To date, these explorers have found icy passages ranging from huge, ballroom-sized open spaces with 40-foot ceilings to narrow, flooded crawl sapces only a few feet high, and passable only with diving gear. The Oregon High Desert Grotto, an affiliate of the NSS, has posted a series of fascinating maps documenting their explorations on their website. The Story Behind the Sandy Glacier Caves? Glacier caves typically form near the snout of a glacier, and explorers simply follow the outflow stream into the cave system. Such was the case with Paradise Ice Caves at Mount Rainier (now disappeared) at the terminus of the Paradise Glacier. 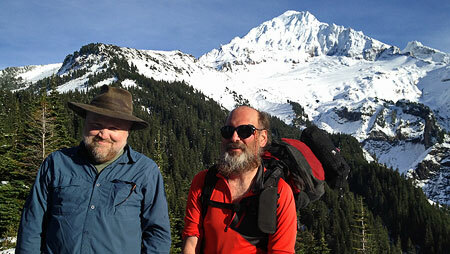 More recently, hikers have explored the outflow opening at the Sandy Glacier, as well. 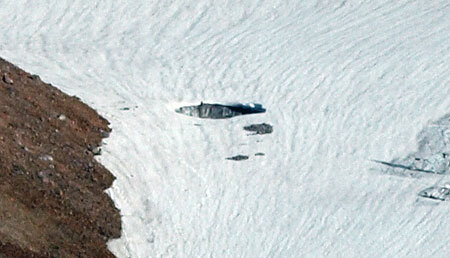 The Snow Dragon caves under the Sandy Glacier are different, however. While the glacier does have an outflow opening to the cave system, the cave network extends far beyond the terminus of the glacier, apparently reaching almost to the headwall, nearly a mile away and almost 2,500 feet above the terminus in elevation. The scale and scope of these caves seems to be partly the result of the glacier shrinking, and not just the effects of melting near the terminus of the glacier. 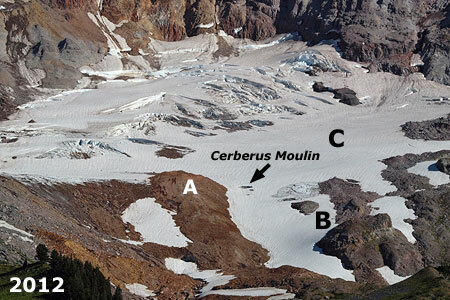 This broader phenomenon first became apparent when a huge moulin — known informally to many hikers as the “glory hole” and formally named the Cerberus Moulin by cavers — appeared in the glacier a few years ago. 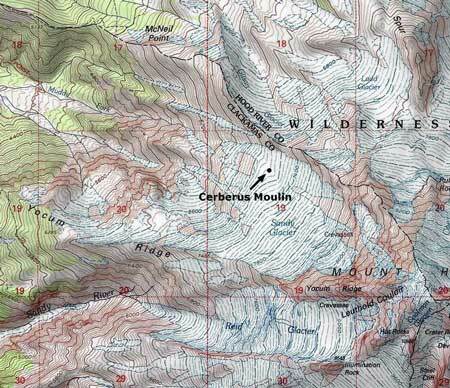 The Cerberus Moulin is plainly visible to hikers from nearby McNeil Point, which also serves as the jump-off point for explorers. 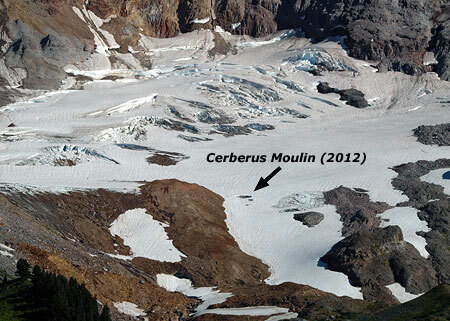 The photo comparison shows big changes in the activity of the glacier, too. 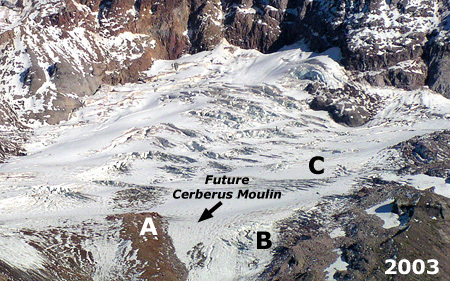 What was once an icefall near the terminus of the glacier (B) in 2003 has since receded to the point that the rock outcrop that was beneath (and formed) the icefall is now exposed in the 2012 image. Likewise, the lower third of the glacier (C) was clearly crevassed and actively moving in the 2003 image compared to the 2012 image, where an absence of crevasses shows little glacial movement occurring today in this section of the glacier. The rapidly shrinking glacier could be an explanation for the relative stability and remarkable extent of the caves underneath the ice. The increased melting is sending more runoff through and under the glacier, helping to form new moulins feeding into the ice caves. The slowing movement of the lower portion of the glacier could also help explain why the cave network has become so extensive, as more actively flowing ice would be more likely to destroy fragile ice caves before they could become so extensive and interconnected. 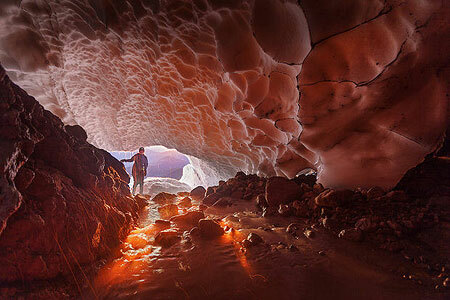 The Sandy Glacier Caves discovery is really part of the much larger story of Mount Hood’s rapidly shrinking glaciers. After millennia of relative stability, we are witnessing broader changes to the landscape surrounding in response to the retreat of the glacial ice. 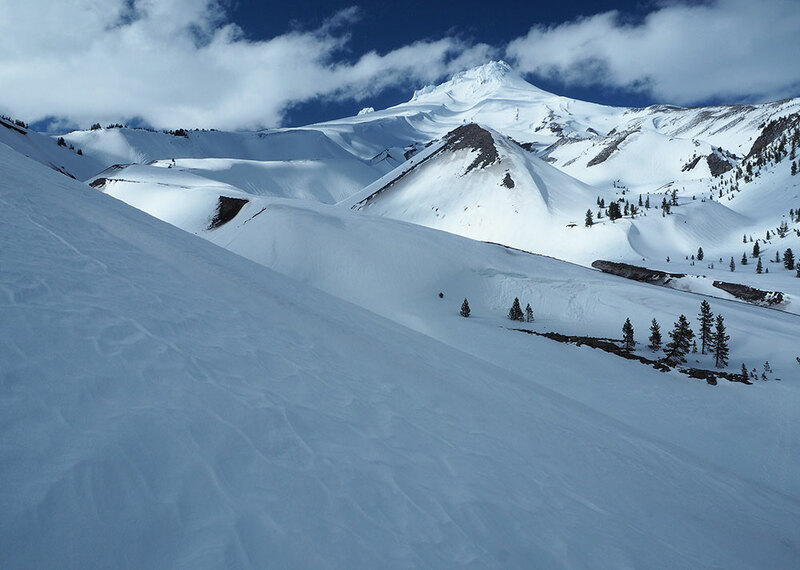 The downstream effects in recent years from Mount Hood’s melting glaciers have been startling, and the Sandy Glacier is no exception. 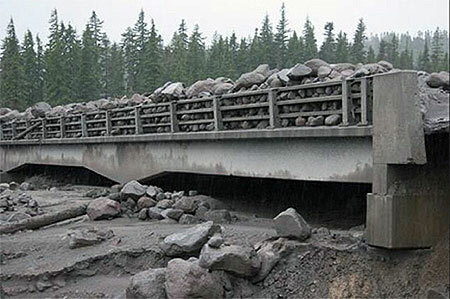 Sometime during the winter of 2002-03, a massive debris flow was unleashed from just below the terminus of the Sandy Glacier, and roared down the Muddy Fork canyon. 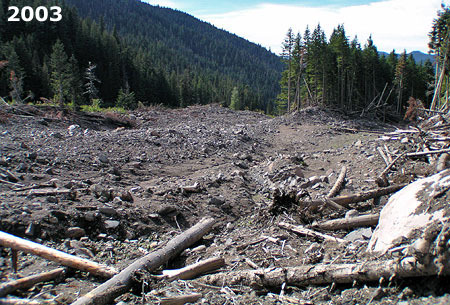 The wall of mud and rock swept away whole forests in its wake, burying a quarter mile-wide swath in as much as fifty feet of debris. 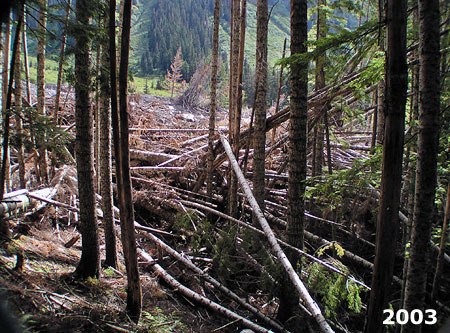 The view (above) looking across the 2002-03 Muddy Fork debris flow shows toppled trees at the margins, while the forests in the main path of the flow were simply carried away. 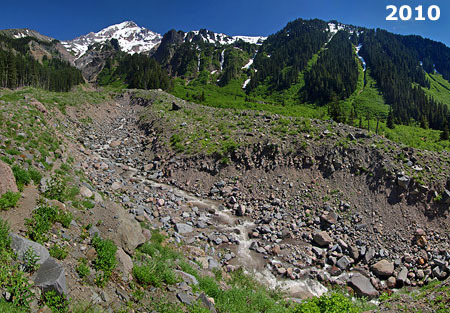 The view downstream (below) from the center of the debris flow shows the scope of the destruction, with the debris at least 50 feet deep in this spot where the Timberline Trail crosses the Muddy Fork. The Muddy Fork has only recently carved its way down through the 2002-03 debris to the original valley floor, revealing mummified stumps from the old forest and visible giving scale to the scope of the event (below). Seven years after the 2002-03 flow, the Muddy Fork had cut a channel down to its original elevation, revealing the full depth of the flow. 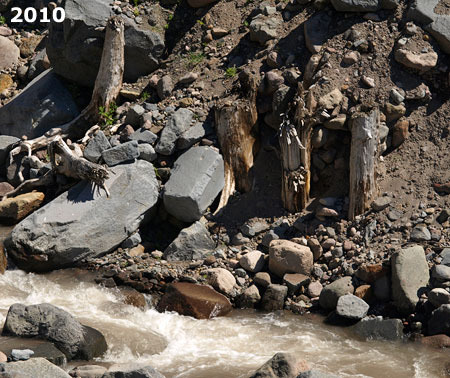 These stumps of trees snapped off by the 2002-03 debris flow have reappeared where the Muddy Fork has carved down to the original river level. 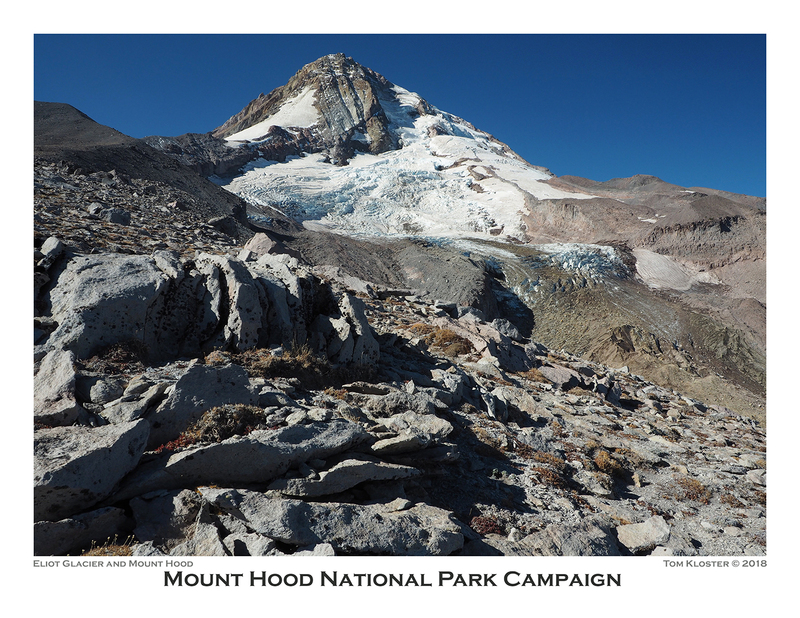 With no way to know how long Mount Hood’s glaciers will continue to retreat, catastrophic events of this kind will recur in the coming decades. 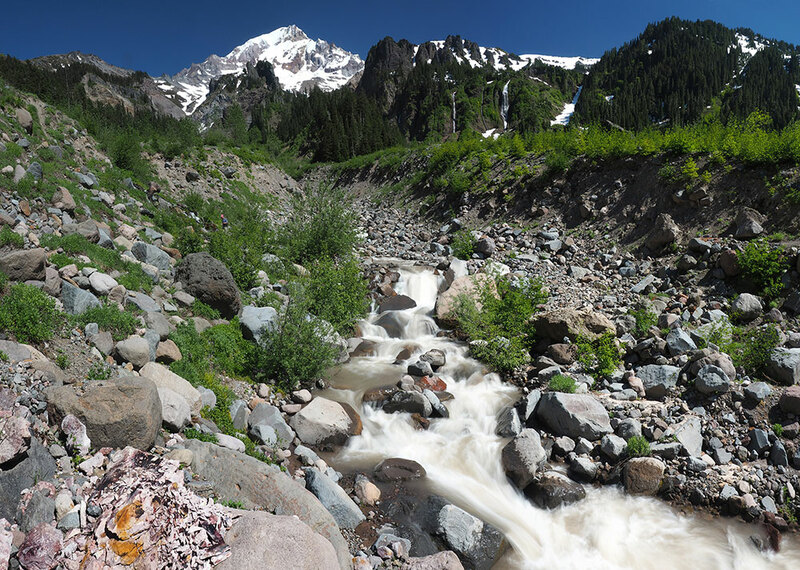 Runoff from the retreating glaciers will continue to carve away at newly exposed terrain once covered by ice, with periodic debris flows occurring as routine events. 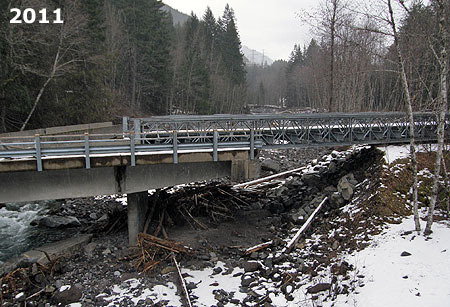 The 2011 event washed out the south approach to the Old Maid Flat Bridge over the Sandy River, forcing the Forest Service to jury-rig a temporary ramp to the bridge. 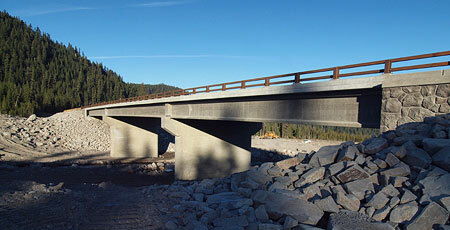 The entire crossing has since been replaced, but like all repairs to streamside roads around the mountain, there is no reason to assume that another event won’t eventually destroy the new bridge, too. Similar events have occurred over the past several years on the White River, Ladd Creek, East Fork Hood River and the Middle Fork Hood River. 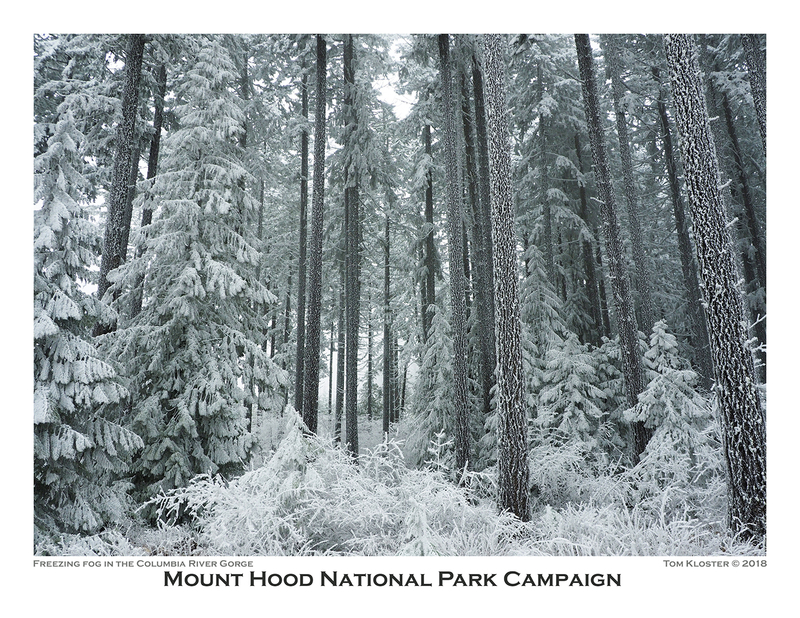 The predicted climate changes driving these events give every indication that we will continue to watch similar dramatic changes unfold around Mount Hood in decades to come. 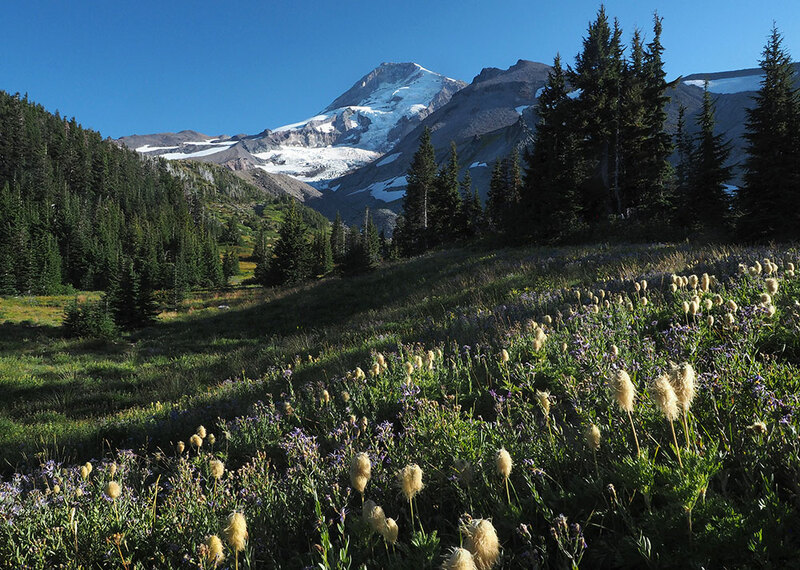 Just as the wildfires that burned through forests on the eastern and northern flanks of Mount Hood over the past few years have given us new insights into the cycle of forest renewal, the unfolding geological events linked to changing glaciers provide a similar opportunity to better understand these natural processes, too. While these destructive events are tragic to our sentimental eyes, the rebirth of a forest ecosystem is truly remarkable to witness — as is the discovery of the Sandy Glacier ice caves in the midst of the larger decline of Mount Hood’s glaciers. All of these sweeping events are reminders that we’re just temporary spectators to ancient natural forces forever at work in shaping “our” mountain and its astoundingly complex ecosystems. So, stay tuned and enjoy, this show is to be continued! For fans of the show, a 25th Anniversary retrospective will also be airing on Thursday, October 3rd. You can learn more about OFG and view their video archive on their website. In the small world department, I had the honor of meeting epic caver, climber and photographer extraordinaire Brent McGregor on the Timberline Trail this afternoon. He and caving partner Eric Guth had spent the night near the entrance to the Snow Dragon Glacier Cave! After learning a LOT more about the Snow Dragon cave complex from Brent today (and having my jaw drop repeatedly as I heard about their exploits under the glacier! ), I’ve updated the above article — including the more accurate use of the name Cerberus Moulin in lieu of the generic “glory hole” nickname that some hikers have been using. Thanks for the terrific conversation, Brent – great meeting you and Eric!